Leg two of the Amazing Race All-stars starts back in Ecuador at the base of an active volcano, an apt metaphor for a country that is threatening to eat one team alive already. After falling and injuring himself last leg, Drew is now suffering from altitude sickness and has to take on oxygen four times. This would be the time for Evil Phil to break out the mountain climbing detour. 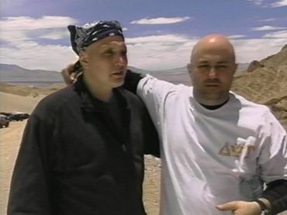 America's favorite fame whores, Rob & Amber, lead the way out of the gate by virtue of winning the first leg, and are sent to Santiago, Chile, just a hop, skip and a jump down the Andes. Their first stop there will be at the corporate headquarters of the world's largest copper mining company. The Amazing Race's product placements have gotten strange. Their strategy continues to be being Rob & Amber, and letting the other teams obsess over them like a horror movie serial killer in reverse, constantly chasing them and putting themselves off their own games. It's hard to argue with success. They're followed by the extremely mellow Oswald & Danny, who are unlikely to fall for this, Teri & Ian, a virtual time bomb ready to explode, Eric & Danielle, who probably just want to find a private tent somewhere, and Joe & Bill, proudly wearing their gay chip on their shoulders. "Who says gay men can't drive?" says Joe. Uh... no one, that I'm aware of. What an interesting and random non-stereotype.